Last month, we unveiled a new vision for the future of SharePoint, and today we’re pleased to release the new SharePoint mobile app for iOS. Install it now and take your intranet with you—your intranet in your pocket. Stay connected to important content, sites, portals and people from across your intranet while on the go. The SharePoint mobile journey starts now. This is a first step, and we are excited to continue to build on what we’ve started. Let’s dive in to the details. 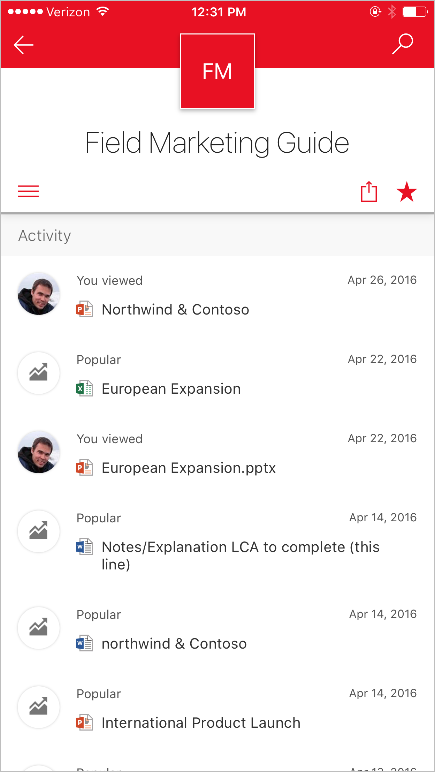 The new SharePoint mobile app helps you keep your work moving forward by providing quick access to your team sites, organization portals and resources, and even a view into what the people you work with are working on. And this new app is infused with the intelligence of the Microsoft Graph, which applies machine learning to activity in Office 365 to connect you to the relevant documents and people around you. 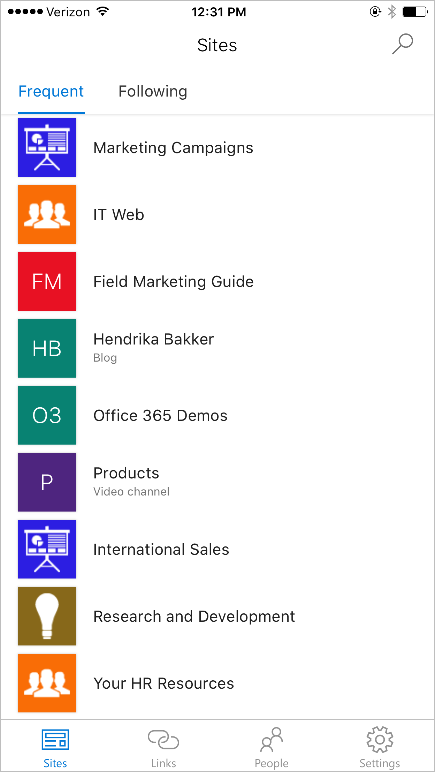 The SharePoint mobile app works with SharePoint Online in Office 365, SharePoint Server (2013 and 2016) on-premises and your hybrid environment. 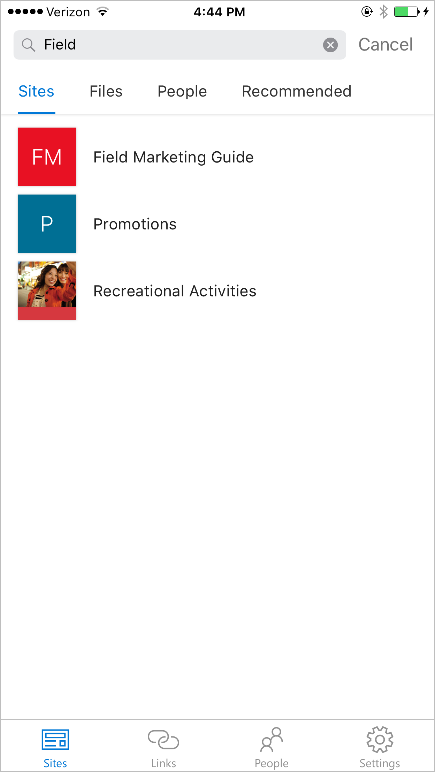 Once you launch the app on your iPhone, you’ll be prompted to sign in with your SharePoint credentials. 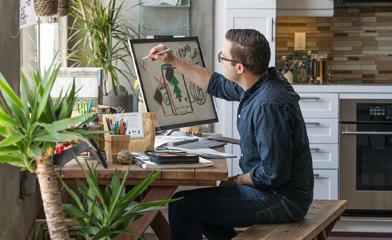 The SharePoint mobile app lets you easily switch between accounts. The Sites tab takes you to a list of the sites you visit frequently and sites you’re following. Click on a site to see recent activity, recent files and the site’s assets (documents, lists, subsites, pages and more). You can also share the site. 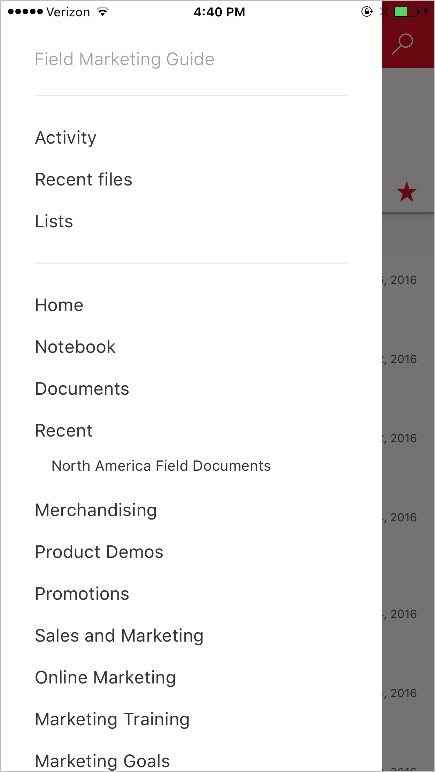 When you click to a team site, you immediately see how the SharePoint mobile app natively renders the site elements quickly and beautifully. 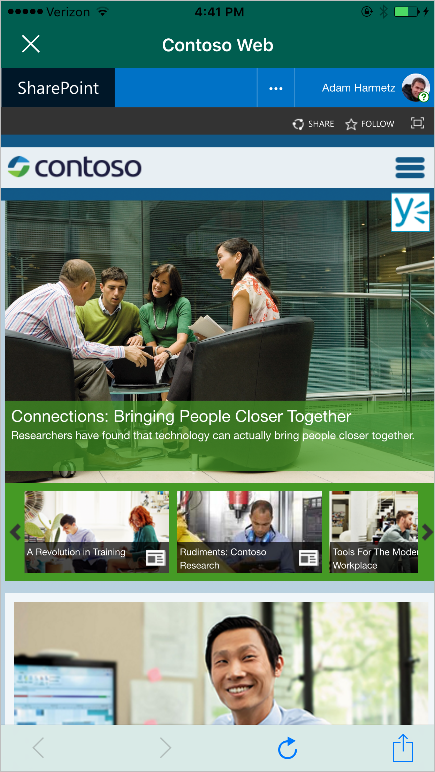 The SharePoint mobile app also links to other Office apps. 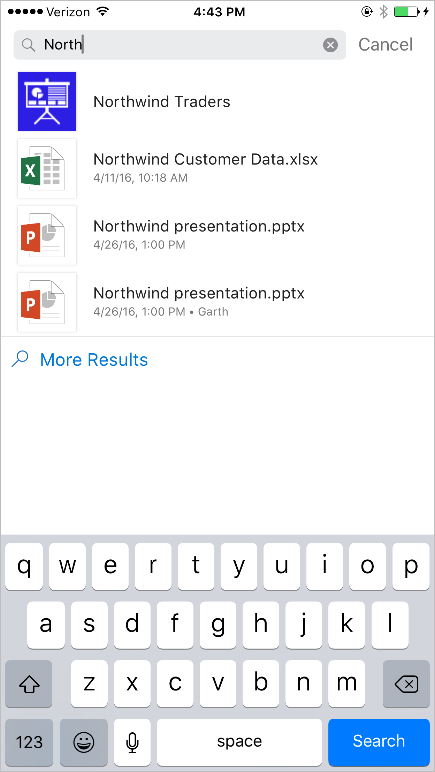 For example, when you click an Office document in the Recent files pivot, it will take you directly into the corresponding Office mobile app. 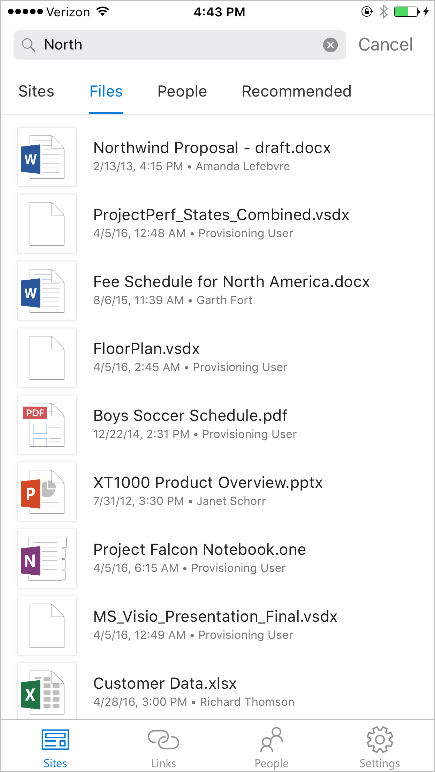 Similarly, when you access a SharePoint document library within a team site, you will be taken into the OneDrive mobile app for iOS to view, share, discover and manage files stored across Office 365. Learn more how the two apps work together. Main Sites tab. Clicking to a team site. 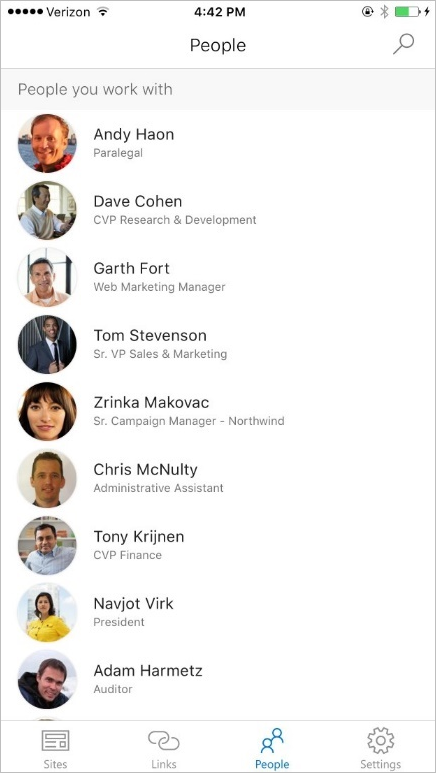 Full navigation of a team site. The Links tab takes you to sites and portals programmed for everyone in your company to see. These are curated by your SharePoint admin(s) from the SharePoint home in Office 365. And if you have invested in responsive, mobile-designed portals, they will shine through in the app. Microsoft, too, is investing in responsive design as a top priority to ensure all new experiences (like the SharePoint home in Office 365, Microsoft Delve and Office 365 Video) are mobile and responsive by default. Main Links tab. Example “Contoso Web” portal. Example Office 365 Video portal. The People tab gives you visibility into what the people you work with are working on. Find and browse colleagues in your network. 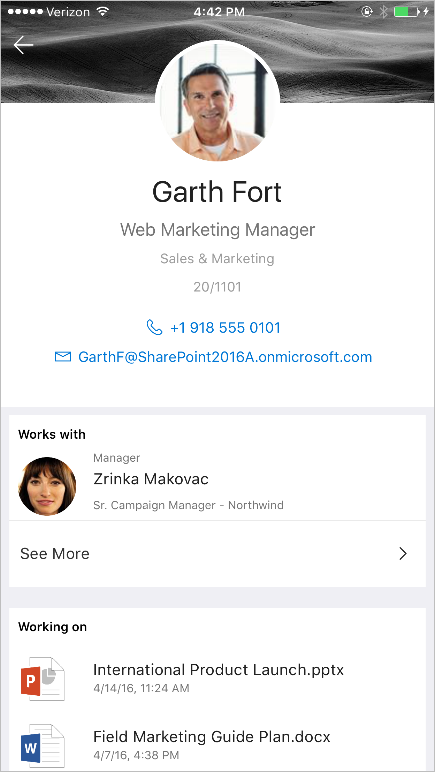 Tap on an individual to see their contact card and discover what they are working on and who they are working with based on intelligence powered by Office 365. Main People tab. An individual card in People. 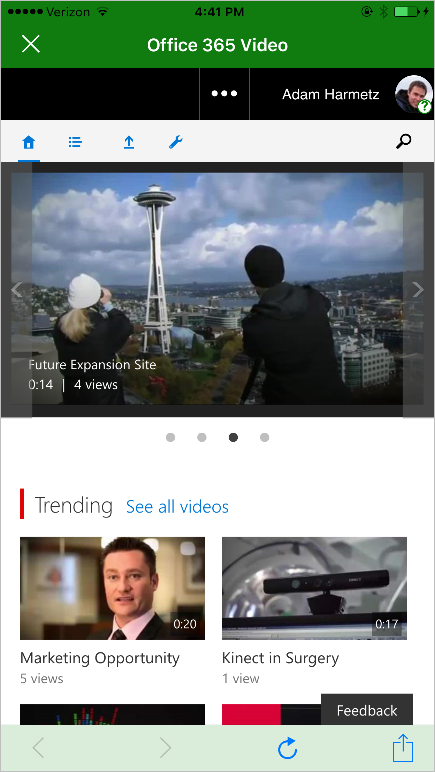 Search—The SharePoint mobile app provides search throughout with clean results—filtered by sites, files and people. 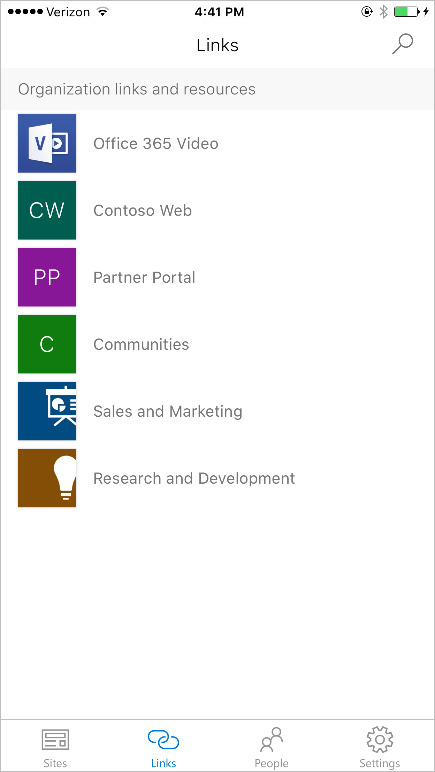 When you perform a search in the SharePoint mobile app, you are connecting through full enterprise search, so you can find content and people from across your intranet, SharePoint team sites, company portals and the OneDrive for Business folders you have access to, including content recommendations powered by the Microsoft Graph. Search for files, sites and people. Search results for files. Search result for sites. Learn more about getting started with the SharePoint mobile app, including technical support information. The SharePoint mobile app for iOS is just a first step on the SharePoint mobile journey, and we are excited to continue to build on what we’ve started. We’ll continue delivering enhancements to the app, such as support of cross-company news and announcements, coming later this year. We are also working on Android and Windows Universal versions, which we expect to release before the end of this year. We want your feedback and ideas. Send us input via in-app Shake, posts and votes to SharePoint UserVoice and tweets to @SharePoint and @Office365 on Twitter. We’re eager to hear your feedback and use it to continuously provide the best intranet in your pocket. Q. Can I use the SharePoint app for online and on-premises? A. Yes. The SharePoint app will connect to your environment whether you are using SharePoint Online in Office 365, SharePoint Server 2013 or 2016, or hybrid deployments. Q. Which authentication methods will the SharePoint mobile app support? A. We support a variety of authentication methods and we will also have support for mobile device management (MDM) and mobile application management (MAM), so the device and the application are secured for IT and the app is easy for users from the start. To learn more, please review the sign-in options for the SharePoint mobile app.